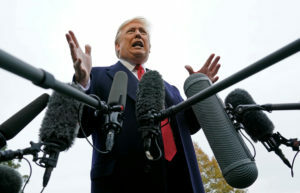 WASHINGTON — Facing closely contested election races in Florida and Arizona, President Donald Trump is spreading misleading rhetoric regarding voting fraud. He says votes are suspiciously appearing “out of the wilderness” in Arizona after Election Day to boost the Democratic candidate in the Senate race. It’s actually typical for the state to take additional days after an election to finish tabulating mail-in votes. Trump also suggests that heavily Democratic counties in Florida may be improperly seeking to inflate the Democratic vote in the state’s Senate and governor races. There’s no evidence of that. The Florida state agencies charged with investigating potential fraud say no credible allegations exist. Meanwhile, on the economy, Trump asserted that U.S. growth under his watch has been unprecedented. In fact, it was surpassed just four years ago during the Obama administration. He also minimized the trade threat from China and claims a U.S. steel industry renaissance that isn’t really happening. THE FACTS: He’s making baseless charges of “stealing” elections in Florida’s Senate and governor races, which headed for recounts due to razor-thin leads held by Republicans Rick Scott and Ron DeSantis, respectively. It’s not uncommon for vote tallies to change in the days after the election as local officials process mailed and provisional ballots. In Florida, both Scott and DeSantis saw their leads dwindle in recent days as the Democratic strongholds of Palm Beach and Broward counties continued to count votes. That vote count concluded Saturday, leading to the Florida secretary of state’s order for recounts after the unofficial results in both races fell within the margin that by law triggers a review. Scott’s campaign also filed a lawsuit asking that the Broward County supervisor of elections be ordered to turn over several records detailing the counting and collection of ballots cast. A judge Friday sided with Scott and ordered Broward’s election supervisor to release that voter information; the ruling did not address allegations of fraud. After the 2016 election, Trump convened a commission to investigate potential voting fraud, after alleging repeatedly and without evidence that fraud cost him the popular vote. Trump won the Electoral College. But he disbanded the panel in January, blaming the decision on more than a dozen states that refused to comply with the commission’s demand for reams of personal voter data. THE FACTS: There is no evidence of anything unusual going on in the vote-counting in Arizona. Trump made the charges of “electoral corruption” and votes appearing “out of the wilderness” as Republican pessimism grew about Rep. Martha McSally’s prospects in the Senate race. However, Arizona normally takes more than a week to count its ballots, and no elected Republican officials in the state have cried foul. It’s possible that Democrat Kyrsten Sinema’s opponent, McSally, could jump back into the lead in the coming days. That wouldn’t be suspicious, either. State law requires the envelope to be sealed and signed, and for elections officials to match each signature to the one on file with the voter’s registration before even opening the envelope. In this election, that’s about 1.7 million individual signatures that had to be confirmed, one by one. A total of about 2.4 million votes were cast in Arizona. The work piles up in the final days before the election as ballots flood in. Voters can also drop off sealed mail ballots on Election Day, adding to the pile. The state’s Republican secretary of state, Michele Reagan, added another reason: election security. To ensure against voter fraud, mail ballots dropped off Election Day — which totaled 320,000 — are double-checked with votes cast at the polls to confirm no one voted twice. The GOP had filed a lawsuit seeking to stop Maricopa and Pima counties from contacting voters after Election Day about problems with the signatures on their mail ballots. But they, Democrats and the state’s counties settled the complaint Friday to essentially allow the rest of the state to follow the more lenient Maricopa and Pima standards. Those standards are what Trump seemed to complain about in his “signatures don’t match” tweet.